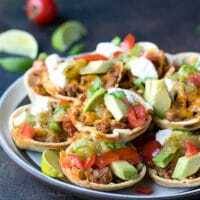 Crunchy Taco Cups With Tortillas, Turkey And Pace® Salsa Verde - very quick and easy to make, with amazing flavors, these mini bites are perfect for a Game Day party appetizer. Combine all ingredients for the seasoning in a small bowl. Add ground turkey and seasoning. Using a wooden spoon or a spatula break meat into large and then small pieces. Cook for 5-7 minutes, until cooked through. Using a 3 1/2-inc or 4-inch round cookie cutter, cut out 24 rounds from the tortillas (2 rounds per tortilla). Place rounds in the muffin cavities and press own. Top with 1 tbsp ground turkey and 1 tbsp grated cheese. Bake for 10 minutes, until cheese is melted. Remove from the oven and let them cool for 5 minutes. Using a fork, carefully remove cups from the muffin tin. Place on a plate or party platter.